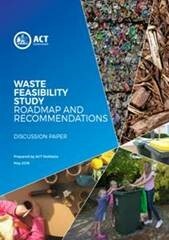 The ACT Government is considering a range of options to manage and minimise waste in the ACT and region now and into the future through the ACT Waste Feasibility Study. The Study was established in mid-2015 to identify a pathway that would achieve the ACT’s waste management targets. This required an understanding of the complex and interconnected nature of waste management - involving almost every aspect of life in Canberra. With the Study now concluded, the ACT Government has received its final recommendations at a time when public interest in waste management is high, with television programs like the ABC’s ‘War on Waste’ prompting necessary discussions on waste management issues. You can review the final outcomes from the Study and the consultation report on the ‘Your Say’ website.